DNG are delighted to represent the sale of 54 Middle Third, Killester, a modern three bedroom detached dormer bungalow on an enviable west facing site overlooking a large mature green area. This bright, spacious home has been maintained to the highest of standards benefitting from an abundance of natural light and a delightful west facing rear garden in total seclusion, ideal for a young family. There is off street parking for 2 cars to the front and the internal fit-out is to the highest standard with no expense spared. Since purchasing, the current owners have extended the site adding approx. 30 sq. m. of garden to the rear and approx. 20 sq. m. to right hand side of the site, complete with a newly constructed boundary wall. The accommodation extends to a total floor area of approx. 1,238 sq. ft. (115 sq. m.) and comprises a T-shaped hallway with storage off, an open plan kitchen/dining/living room with sliding doors to the rear garden, 2 spacious double bedrooms with bay windows and a bathroom on ground floor level. Upstairs, first floor accommodates a further double bedroom, office/playroom and shower room. 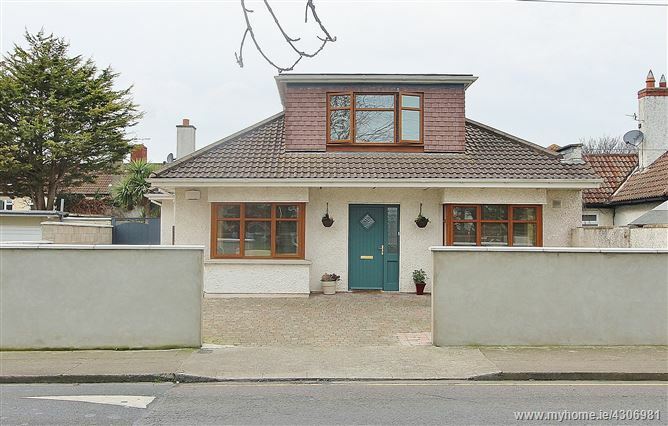 Middle Third is conveniently tucked away off the Howth Road within a short stroll of all local amenities in Killester village including, shops, boutique restaurants and cafes, churches and leisure facilities. Killester DART station is a 2 minute walk away (250 m) from the property giving direct access to the City Centre (5 km away). Semi-solid wood flooring, understairs storage, hot-press off, recessed lighting. Semi-solid wood flooring in the living and dining area, tiled floor and splashback in the kitchen, fully fitted solid oak kitchen, feature brick fireplace, sliding doors to rear garden. Semi-solid wood flooring, large bay window with recessed lighting. Semi-solid wood flooring, large bay window.